At 63, Tom Hassenfritz of Mt. Pleasant, Iowa traded a tractor for an airplane. That was 40 years ago. Tom Hassenfritz of Mt. Pleasant was taking his in-flight test for a pilot's license at Hannibal, Mo. Tom received his pilot's license and bought a Cessna 182. But as his family grew, he became immersed in his farm implement business. 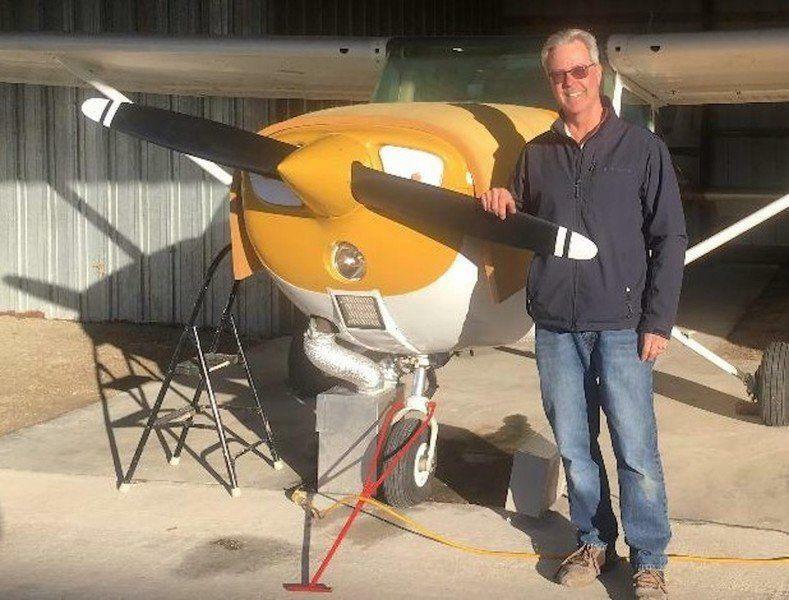 When he found out what his life insurance was going to cost with a pilot's license, he decided it might be time to sell the airplane. Which he did. Fast forward to this year. Tom is a wheeler-dealer in the farm implement business and has been known to trade motorcycles and snowmobiles for tractors. A customer of Tom's owned a 1976 Cessna 172M. Because of health issues, the customer couldn't fly anymore. Tom thought, “Hmm, maybe I could fly again.” Pilot's licenses never expire. Presto-changeo, Tom traded a tractor for an airplane. It even came with a spare engine. The airplane was in Burlington and Tom lives in Mt. Pleasant. Tom was under the impression that all he would have to do would be to put some gas in the airplane and fly it to Mt. Pleasant. Wrong. The airplane hadn't been flown in two years and needed to have an annual inspection. It was finally impressed upon Tom that this was an airplane, not a tractor. The inspections were done and Tom passed his pilot's physical. He looked up his old flight instructor and brushed up on his flying skills. There was no horse on the runway this time. On his first solo flight, Tom sat at the end of the runway and asked himself, “Do I really want to do this?” A saying kept going through his head, “Takeoffs are optional, landings are mandatory.” He held his breath and went for it. The only problem was there was fresh snow on the ground, and everything looked different—he lost his perspective. His inclination was to panic, like when you have a scuba mask on and can't breathe. But he kept his composure and made it back to the airport safely. “Wing to the wind, rudder to the runway,” he told himself. It's the exhilaration of flying, up there above everything, looking down, the feeling of freedom, working with that edge, maybe, that he and most pilots love. Tom never rides in a big commercial aircraft without being in awe that it can even fly. He invested in a GoPro, installed it on the dash of the Cessna, and studies his takeoffs and landings. According to his logbook, he's been up 20 times. Tom has plans to visit his brother in Minneapolis, his daughter in Bolingbrook, Illinois, and maybe even his sisters in Florida. Gulp. “Shoot,” Toms says to no one, “It's too crappy to fly. This is a good story. Fun to read and our best to Tom. This story is waiting for a new death report here. All the best to friends & family of Tom, in advance.